With much anticipation, the Second Avenue subway line is opening up on December 31st, 2016 at 11:45PM for its inaugural run after the stroke of midnight. For anyone that has not kept up the with century of planning and disputes surrounding the construction of the Second Avenue subway line, this is a huge deal for the city. To clarify, the Second Avenue subway will be an extension of the Q Train, which will continue service from 57th Street and 7th Ave. to 63rd and Lexington and make its debut on Second Avenue on 72nd St., 86th St. and 96th St., which will all be serviceable by brand new subway stations. Also, this opening only represents Phase I of the project, with three additional phases to proceed in the unforeseeable future due to budget issues. How will the Second Avenue Subway Line Impact You? For all the residents and businesses that have dealt with the disruptive nature of the Second Avenue subway line's construction, the day where you reap the rewards of your patience is finally here. Or is it?! That really depends on where you stand. Owners of property have been waiting for this day, while those that currently rent there, inclusive of businesses, are likely fearing this day. The Second Avenue subway will have significant impact on property values, equally so in rental and sales prices. While sales prices have already been reaching record highs, and rental values have been creeping up as well, rental prices are about to skyrocket, relative to where they've been in the past. 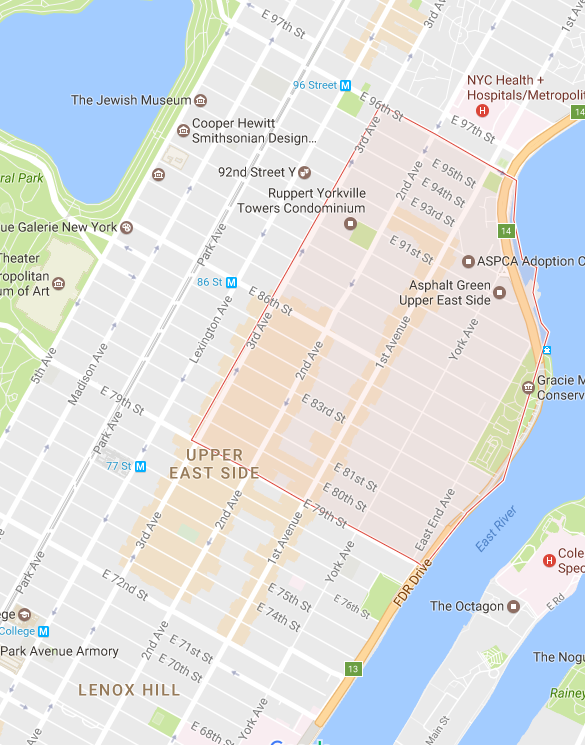 The main neighborhood that is being impacted with higher property values due to the Second Avenue subway line is the Upper East Side. To be more specific, Yorkville and Lenox Hill will be the main benefactors of the opening of these three new stations and extension of the Q Train. Yorkville will benefit moreso than Lenox Hill, as the subway stations will cover a larger swath of its territory, and traditionally rentals and co-ops have always been slightly cheaper there. Yorkville is mapped out above. According to StreetEasy, rental values on the Upper East Side along Second Avenue have already increased by 27% over the past 5 years. Over this time period, the neighborhood has had an influx of young professionals and families. With the neighborhood becoming as popular as ever, the 4, 5 and 6 Trains have become completely overcrowded. Second Avenue subway (Q Train) to the rescue! Rental value changes on the UES over the past 5 years. While the change in rent has been significant over the past five years, it has not been due to the anticipation of the Second Avenue subway lie. Remember, renters don't pay a premium for anticipatory factors, in the same way that buyers do. With that being said, given the convenience factor of the Second Avenue subway line finally being operational, renters can expect to be hit with some fairly significant increases. With the new subway line opening, commuters who live along Second Avenue, First Avenue and York Avenue will shave off a significant amount of time from their commute. So much so, StreetEasy estimates a $462 median increase in monthly rents for apartments within a certain quadrant. Higher convenience to public transportation = higher rents. With increased rents across the board, it comes to no surprise that sales prices will also be positively impacted. The new infrastructure has attracted some of the city's hottest developers, including Extell Development. Extell is currently in the process of building a 30-story, 83-unit building called The Kent, with prices per square foot starting just shy of $2,000. With the rise of new development sales, taking place in the neighborhood, resale prices will also follow and approach higher echelons. Overall, the Second Avenue subway line will be a boon to real estate prices, particularly between 72nd and 96th Streets on the Upper East Side. It will be exciting to see how soon next phase of the build proceeds. One thing is for sure, you can expect it to take many more years! Do you live on the Upper East Side? What are your thoughts about the opening of the Second Avenue subway line? Share your feedback below and join the conversation.